Varanasi is probably the most spiritual place in the world, I guess you have Lourdes and Vatican City, but trust me this places smacks you in the face with religion. You can’t turn a corner without seeing religious icons, ceremonies or indeed dead bodies being burned. I’m not making it sound very appealing but it is one of the most interesting places I’ve ever been. I was lucky enough to take a boat on the river Ganges that flows through Varsnasi both at sunrise and sunset. It’s the best way to see the ghats where locals bathe in the supposedly holy water, dispose of cadavers and ashes and even do their laundry. In the morning it’s a very serene and tranquil affair, seeing the sun rise over the haze (it’s always hazy in India) is such a calming experience. Probably because you miss the worst of the heat too. I even did some souvenir shopping on the river, I bought some Ganesh dolls forms man in a boat. Obviously I haggled but it’s definitely the first time I’ve bartered on water! 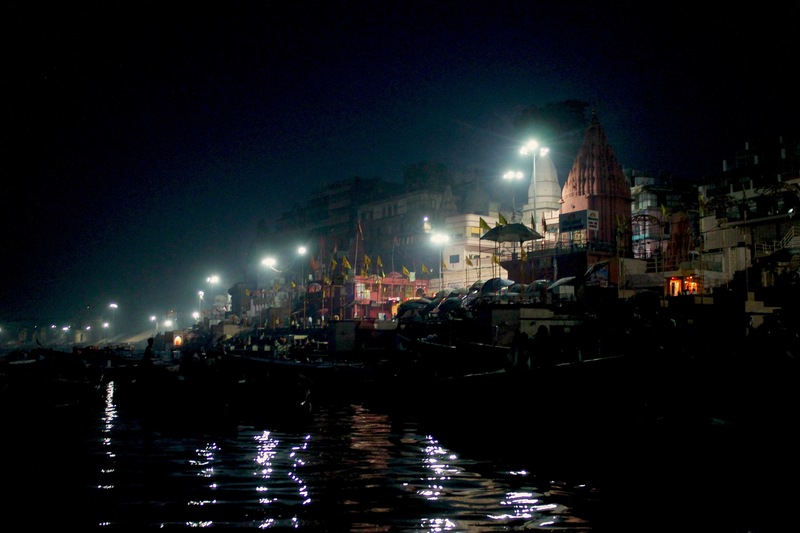 At night going on the Ganges is an altogether different scenario. It’s a crazy riot of sound and colour with fire, lights, drums and horns filling up the whole of the river bank. It’s such a different way of seeing worship – in the west it’s all a bit more… subtle. I also lit a candle to float down the river. Aside from getting eaten alive by the many, many mosquitos that congregate on the river at dusk this was a truly wonderful experience. If you have chance to visit Varanasi then I urge you to do so, there’s no place quite like it. Varanasi is amazing, intense, spiritual. Dan , you could do India solo but Incredible India for me is best when shared with others. I went for four months in 2013 and again in 2015 with my professor husband and American architecture students. I loved every minute and would go back tonight! Under no circumstances eat street food or drink tap water.we traveled over India and Varanasi is my favorite place in all of India. Have a great trip! Your life perspective will never be the same! I can imagine! I’ve heard it’s brilliant food – I think i might have to just risk it 😉 I’ll have a read of your articles 🙂 thanks!